Bianca Andreescu saved a match point as she produced an astonishing fightback to beat Irina-Camelia Begu in the first round of the Miami Open. Andreescu made history by becoming the first wildcard to win the Indian Wells Open on Sunday and those exploits appeared to have caught up with her in Florida. Begu led 5-1 in the second set after winning the first, but the 18-year-old Canadian won five games in a row before bossing a tie-break and going on to secure a stunning 4-6 7-6 (7-2) 6-2 victory. 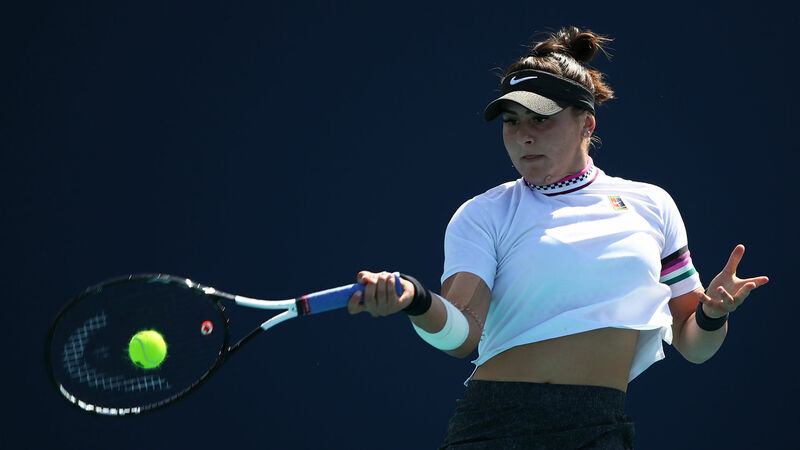 Andreescu came from a set down to beat the Romanian at Indian Wells and demonstrated great character to rally from the brink of defeat and set up an encounter with Sofia Kenin - the last player to beat the teenager in Acapulco. Begu broke in the opening game of a match that could not be played on Wednesday due to rain and although tournament debutant Andreescu got back on serve, she was broken again immediately to go 3-2 down. Andreescu made too many unforced errors and looked heavy-legged on Butch Buchholz Court, the composed Begu wrapping up the opening set and breaking three times to go 5-1 up in the second. The heavy-hitting world number 24 - playing with strapping on her right arm - roared back as Begu faltered with the second round within touching distance, a match point coming and going as the nerves jangled. Andreescu was like a different player, breaking with a scorching forehand winner to make it 5-3 and again to level, then dominating the breaker with an aggressive approach. Begu looked to be haunted by losing control of the match and Andreescu capitalised, breaking to love in the first game of the decider with a spring in her step and again to lead 5-2 as she pulled off a magnificent fightback.